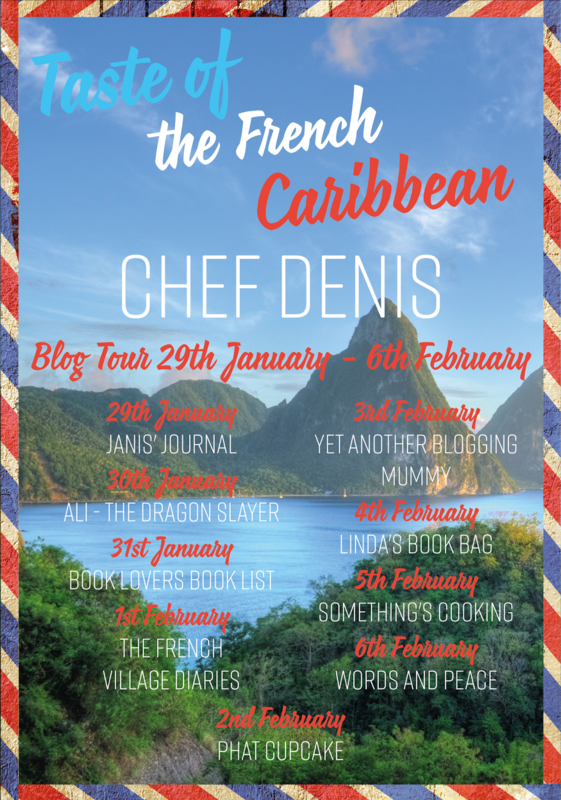 Today I am taking part in the blog tour for the Taste of the French Caribbean by Chef Denis. While this book may only have a tenuous link to France, the one thing I have missed since moving to France is a bit of hot and spicy food, so with it’s Jerk and Creole Caribbean spice flavours, I couldn’t resist this book. In A Taste of the French Caribbean, Chef Denis shares a great mix of recipes, from soups, fish, meat and vegetable dishes, plus sauces and desserts. From the beginning the soup section excited me, yes I know, but I do love a good warming and full-flavour soup and Chef Denis has quite a selection. This summer, with our potager harvest, I will be trying out his Creole Tomato soup and his Courgette and Mint soup. His Roast Pumpkin and Ginger one was as delicious as it sounds (although I used a home grown winter squash rather than a Caribbean pumpkin) and the Red Onion soup is next on my list to try. I also found I was drawn to the sauce section as this is where so many lovely flavours were combined that can be used to enhance lots of ordinary weekday meals, the curry sauce in particular I can see becoming a regular in my kitchen. A book with it’s roots set in the Caribbean naturally contained some unusual and (for me at least) new ingredients. Thankfully Google came to my rescue with images and descriptions of Christophene, Kalaloo leaves and even pig tails, as I wasn’t sure at first if he really was using piggy tails! He was, and as someone who is more than happy to make a pig trotter stock I was quite excited by this discovery. I loved that this book opened my mind to new ideas, including the use of sweet potato in a lemon drizzle cake, something else I am determined to try (the list kept growing), especially as from a first glance none of the recipes look daunting. As part of my review I agreed to do a taste test and was given one of his recipes to try and have to admit to being rather surprised at being given Vegetable Lasagne. When I think of Caribbean recipes, lasagne doesn’t immediately spring to mind, but when I noticed the addition of Creole Pepper Sauce, I was intrigued and couldn’t help feel that a bit of spice would be a perfect addition. However, I live in rural France and I searched high and low for Creole Pepper Sauce only to be left disappointed. Not one to give up I searched online for an ingredient list and then added a tiny pinch of turmeric and mustard powder to a teaspoon of French Purée de Piment (puréed hot pepper sauce). I hope Chef Denis forgives me, I certainly loved the warming kick it gave my vegetable sauce. I also had to substitute roasted winter squash for the baby corn and mangetout in the recipe as France is much more into selling seasonal produce than Tesco is. I have a real love hate relationship with lasagne. I love it, but compared to most pasta dishes it is quite a hassle, so I find I rarely make it. It was therefore a nice change to give this recipe a go and as well as loving the pepper spices, I also loved the addition of a bay leaf and 50ml of white wine to the béchamel sauce (something I have never done, but will be doing again). The only thing that would have been nice is someone to do the washing up for me; lasagne seems to create quite a collection of saucepans and utensils, but it was worth the effort. Here is the recipe, should you wish to give it a go. 1. Sauté the vegetables in a pan with hot oil, add mixed herbs and tomato puree, cook for two minutes. 3. Cook until the vegetables are tender. 4. Place the lasagne pasta in a baking tray in layers. On top of the first layer, pour some of the cheese sauce, then another layer of the pasta followed by the mixed vegetables, more pasta and cheese sauce and so on. 5. You should have four layers in total. The last layer should be cheese sauce. Sprinkle the grated cheese over the top. 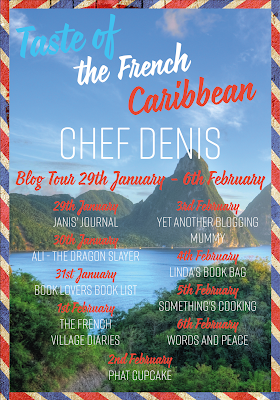 Taste of the French Caribbean is published by Clink Street Publishing and is available in ebook and hardback formats. Links to Amazon can be found below. If you love cooking meals that have a bit of spice and heat, I'm sure you will find lots to please in this cookbook.